Dr. Dock Dockery, Director of the the International Foot & Ankle Foundation for Education and Research, is pleased to announce that the newly organized non-profit Rhett Foundation for the Advancement of Podiatric Medical Education has become IFAF's newest 2018 Diamond Sponsor and has provided a substantial educational gift to partially benefit our organization through residency education, surgical training workshops, research projects, and to help support the Yucatan Crippled Children Project. Dr. Bradley Bakotic, a long-time active member of the IFAF Board of Medical Advisors, has been a major contributor to the support and education of podiatric teaching organizations and we are grateful for his commitment to further IFAF's mission of providing the highest level of continuing podiatric medical education and research around the globe. Dr. G Dock Dockery, Director of the International Foot & Ankle Foundation for Education and Research has received the 2017 Podiatry Management Lifetime Achievement Award and was inducted into the Podiatry Hall of Fame at the APMA National Meeting on July 29, 2017, at a luncheon in his honor at the Gaylord Opryland Resort, Nashville, Tennessee. Congratulations to Drs.John M. Schuberth, Jeffrey C. Christensen and Chad L. Seidenstricker on the publication of their paper entitled: "Total Ankle Replacement with Severe Valgus Deformity: Technique and Surgical Strategy" in the Journal of Foot & Ankle Surgery, Issue 2, Volume 56, 2017. IFAF would like to congratulate Dr. Peter Bellezza, an R3 at the Swedish Podiatric Surgical Residency in Seattle for his case report series in the latest Journal of Foot & Ankle Surgery. Well done Dr. Bellezza! Congratulations to Drs.Kenneth Hegewald, Megan Wilder, Todd Chappell and Byron Hutchinson on the publication of their retrospective paper entitled: "Combined Internal and External Fixation for Diabetic Charcot Reconstruction: A Retrospective Case Series" in the Journal of Foot & Ankle Surgery, 55:619-627, 2016. Congratulations to Drs.John M. Schuberth, Melinda A. Bowlby and Jeffrey C. Christensen on the publication of their paper entitled: "Combined Total Ankle Arthroplasty with Posterior Tibial Tendon Transfer for End-Stage Cavovarus Deformity" in the Journal of Foot & Ankle Surgery, 55:885-890, 2016. Rex Z. Nilson, DPM, Board of Directors, IFAF, received the NW Podiatric Surgical Residency Consortium's 2016 MVP Award at the Forty-Six Podiatric Surgical Residency Graduation held at the beautiful Alani Room, Palisade Restaurant, in Seattle, WA, on June 18, 2016. The Board of Directors of the International Foot & Ankle Foundation would like to welcome the following 2016 residents to the IFAF Podiatric Surgical Consortium. This year we are happy to welcome Drew Bekins, DPM, from Des Moines University, College of Podiatric Medicine and Surgery, and Ryan Schwanke, DPM, a graduate of Wm M Scholl College of Podiatric Medicine to the Swedish Podiatric Surgical Residency's 3-year podiatric residency program (PM&S-36) at Swedish Medical Center, Seattle, Washington. We also want to welcome Amanda Kamery, DPM from the College of Podiatric Medicine at Kent State and Mallory Schweitzer, DPM, also a graduate of Wm M Scholl College of Podiatric Medicine to the Franciscan Foot and Ankle Institute's 3-year podiatric residency program (PM&S-36) at St. Francis Hospital, Federal Way. These outstanding physicians were presented their white coats by our graduating residents; Drs. Gina AmicaTerra, Melinda Bowlby, David Larson, and Casey Ebert at a ceremony on June 18, 2016. As we say goodbye to our graduates, we are looking forward to having these outstanding new doctors join our fraternal community. Dr. Dock Dockery, Chairman of the International Foot & Ankle Foundation, presented Dr. Bradley Bakotic with the 2016 IFAF Outstanding Teaching Award, at the IFAF 38th Annual Seattle Summer Seminar, June 16, 2016. The award states: "FOR YOUR ADVANCEMENT OF FOOT & ANKLE MEDICINE AND SURGERY THROUGH DEDICATION TO CONTINUED MEDICAL EDUCATION AND THE TEACHING OF MEDICINE & SURGERY TO PODIATRIC RESIDENTS"
Recipients are nominated and voted on by the Residents, Medical Advisory Committee and Board of Directors of the International Foot & Ankle Foundation for Education and Research, and Delivered at the Forty-Six Graduation of the NW Podiatric Surgical Residency Consortium, in Seattle, WA. Dock Dockery, DPM, IFAF Director, presenting the Outstanding Teaching Award to Bradley Bakotic, DPM, DO. 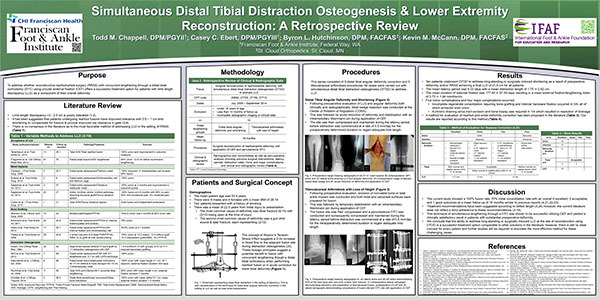 IFAF would like to congratulate Dr. Casey Ebert, PGY2 Medicine and Surgery Resident with the Franciscan Foot and Ankle Institute in Federal Way, WA, whose poster took 1st place in the Case Studies Category, entitled "Focal Dome Osteotomy and Distraction Osteogenisis for Correction of a Post Traumatic Tibial Malunion" at the ACFAS annual meeting in Phoenix, February 2015. Congratulations on a fantastic job Dr. Ebert! We are proud of you and our association with your program. Congratulations to Dr. Kristin J. 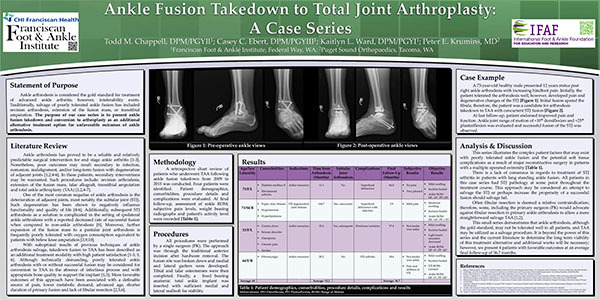 Brown, PGY3 Medicine and Surgery Resident with the Swedish Podiatric Surgical Residency in Seattle, who's poster, titled "Utilization of SPECT/CT for Differentiating Unresolved Peri-Prosthetic Ankle Pain" won 2nd place in the Case Studies Category of the poster contest at the ACFAS annual meeting in Phoenix, February 2015. Way to Go Dr. Brown!! The "International Foot & Ankle Foundation for Education and Research" has had another fantastic year. We have added a number of new faculty speakers to our scientific courses and several new venues for the meetings. We have added new workshop options and three Ankle Arthroscopy Skills Courses. And, we have added new members of the Board of Advisors as well as new members of the Board of Directors. The website, www.internationalfootankle.org, is very active and our Facebook friends continue to grow. 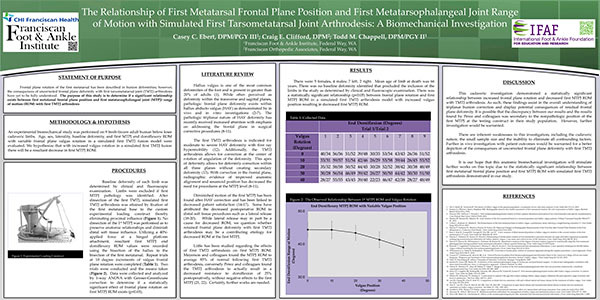 The IFAF's official, free access, online journal, The Foot and Ankle Online Journal, www.faoj.org, under the guidance of Dr. Craig Clifford, Editor, is continuing its rapid growth and international exposure. The Foundation's 2018 academic calendar is filled with exciting and stimulating programs in incredible and beautiful locations. A wide-ranging collection of new national and international seminars for 2018-19 has been approved, which will offer the latest and most up-to-date topics intended to augment your current knowledge. These meetings are designed to provide you with helpful and no-nonsense clinical information that you can take back to work and put into practice right away. All of these motivating scientific programs are provided as a first-class opportunity of continuing medical education for obtaining up-to-date medical and surgical information. You will also increase your knowledge about modern concepts and improved medical equipment, new techniques and surgical procedures for lower extremity care. Would you like to get even more out of the continuing medical education meetings? Consider becoming an IFAF Member. As a member, you will receive 20% discounts on meetings and much more. If you are concerned about being away from your family in order to get your annual credit hours, consider taking them to work with you by attending an upcoming IFAF seminar in a magnificent location. Get top continuing medical education credits and family time combined...it's a win-win solution! "Education is very important to me, but family time is even more important, and it should be to you too!" Douglas Hale, DPM, FACFAS, Director, Swedish Foot and Ankle Surgical Residency Program at Swedish Medical Center in Seattle. Many thanks to the current officers of the Residency Training Committee of the Swedish Foot and Ankle Surgical Residency Program, Drs. Kirk Alexander, Eric Powell and Ryan Bierman; and, to the Educators and active Grand Rounds members, Drs. Richard BouchÃ©, Gregory Grant, Eric Heit, Matt Labella and Michael Vickers, who have been instrumental in continuing the positive academic environment for the Swedish residents. They continue to provide an environment of academic challenge for our residents. Also, thanks to the physicians who provide cases for our residents to become proficient in reconstructive foot and ankle surgery. Thank you to Dr. Schuberth, a graduate of our program, who was influential in providing training to our residents in ankle replacement, complex trauma, revision surgery, and complex salvage reconstructions. The commitment to research with regards to the surgical biomechanics of the foot and ankle remains one of the important focal points of our program. Under the direction of Dr. Jeffrey Christensen, Research Director, our residents continue to thrive in an environment conducive to research excellence. Our 2018 graduating residents will be Michael Gerrity, DPM, and Midori Higashi, DPM. Their commencement ceremony will be held along with the St. Francis Residency Program next June. We appreciate the surgical and academic strength of our R2 residents Drew Bekins, DPM, and Ryan Schwanke, DPM. Our collaboration with the St. Francis Program and International Foot & Ankle Foundation has allowed both programs to achieve new levels of excellence and continue being two of the best programs in the country. We greatly appreciate the hard work and commitment of the Board of Directors of the International Foot & Ankle Foundation and the Waldo Foundation. The Franciscan Foot & Ankle Institute celebrated its 27th Graduation in conjunction with the Swedish Foot and Ankle Surgical Residency Program in 2017. The NW Residency Consortium, sponsored by the International Foot and Ankle Foundation, has helped both of our programs become two of the best programs in the country. I would like to thank the Board of Directors of the International Foot and Ankle Foundation and the Waldo Medical Foundation for their unwavering commitment to these two residency programs. I am happy to announce that Dr. Craig Clifford will be assuming directorship of the residency program starting January 2018. I am confident that he will help take our program to the next level. We are very proud of our graduating residents this past year! Todd Chappell, DPM, started his fellowship with Shannon Rush, DPM, in Palo Alto, California, and Christyn Marshall, DRM, started private practice with William Stewart, DPM, in San Ramon, California. We would like to welcome the incoming first-year residents, Stephanie Oexeman, DPM, and Kelsey Millonig, DPM. The second-year residents are Mallory Schweitzer, DPM, and Amanda Kamery, DPM. Finally, the third-year residents are Kaitlyn Ward, DPM, and Anthony Romano, DPM. The Franciscan Advanced Foot & Ankle Fellowship is in its second year and the current fellow is Lisa Grant-McDonald, DPM. To all the members of our training committee and all of the other physicians within CHI/Franciscan who have participated in the training of the residents, we thank you! Without your dedication, time, and support we could not train some of the best residents in the country. Dr. Dock Dockery, Chairman of the International Foot & Ankle Foundation for Education and Research--IFAF (formerly, The Northwest Podiatric Foundation) along with Dr. Byron Hutchinson, Board of Directors, recently traveled to the Yucatán Peninsula in Mexico, as part of the medical team for Barry University's Yucatán Crippled Children Project--YCCP. While there, Dr. Dockery presented Dr. Keith Kashuk, of the YCCP, with a check from IFAF in the amount of $5,000. Donations were raised by 31 friends and colleagues of Dr. Dockery specifically for the YCCP. This was just part of a long-standing commitment, IFAF and Dr. Dockery have with this project. Last year in November, following a fund-raising pediatric seminar held in Mérida, IFAF donated $4,800 to the YCCP to help buy supplies and equipment for the humanitarian trips. The YCCP was established in 1996 by Charles "Chip" Southerland, DPM to aid the needy children and families of the Yucatán Peninsula. The Seattle and Miami teams have been volunteering and traveling together for the YCCP twice a year for the past 13 years. During each trip several needy children with foot and leg deformities are treated with corrective surgeries. A local Mexican orthopedic surgeon works with the American surgeons at the Star Médica Hospital in Mérida and does all the postoperative follow-up care. Once the patients are stable, they are referred to a rehabilitation specialist for physical therapy and rehabilitation, along with bracing or orthotics as needed. During the trip of November 10-12, 2010, the Seattle team also included two surgical residents, Dr. Craig Clifford and Dr. Jeffrey Robertson. They were joined by the Miami team, headed by Dr. Keith Kashuk, along with four Miami residents. Local support for the project is provided by the Desarrollo Integral de la Familia (DIF), which is a Mexican public institution of social assistance that focuses on strengthening and developing the welfare of Mexican families. IFAF will continue its support of The YCCP through various fundraising efforts and its twice-yearly medical/surgical trips. Presentation of $5,000 donation to the YCCP. L-R: Alejandro Ojeda Manzano, Director of Rehabilitation, Progreso; Dr. Dock Dockery, Seattle Team Leader; Dr. Byron Hutchinson, Senior Surgeon; Marï¿½a Magadán Alonzo, President, DIF Progreso; Dr. Miriam Gutiérrez Flores, Director, DIF Progreso; Dr. Keith Kashuk, Miami Team Leader.